You will enjoy this KZ Escape travel trailer because of its convenient and stylish components for your medium-size family. 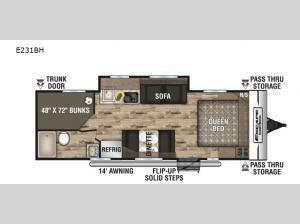 There are plenty of sleeping arrangements between the queen-size bed, sofa, booth dinette, and double-size bunks. If you need lots of space to keep all of your camping gear, then have no fear because the pass-through storage gives you plenty of it. The best way to end your night will be relaxing underneath the 14' electric awning with LED lights. KZ Escape lightweight travel trailer, expandable, or toy hauler models combine comfort and functionality into one. The Escape shows this by offering cable hookup, using LED lighting, and equipping a power awning with an LED light strip to enhance each late-night party. KZ is the only brand that uses the Aqualon Edge material with a 7-year warranty and Alum-a-Tough roofing with a 12-year limited warranty. These warranties prove they are built to last. The Off-Road package is a feature that shows this brand is also equipped to satisfy your desires to travel off the beaten path. So come choose your new Escape and show it off to your friends and family!